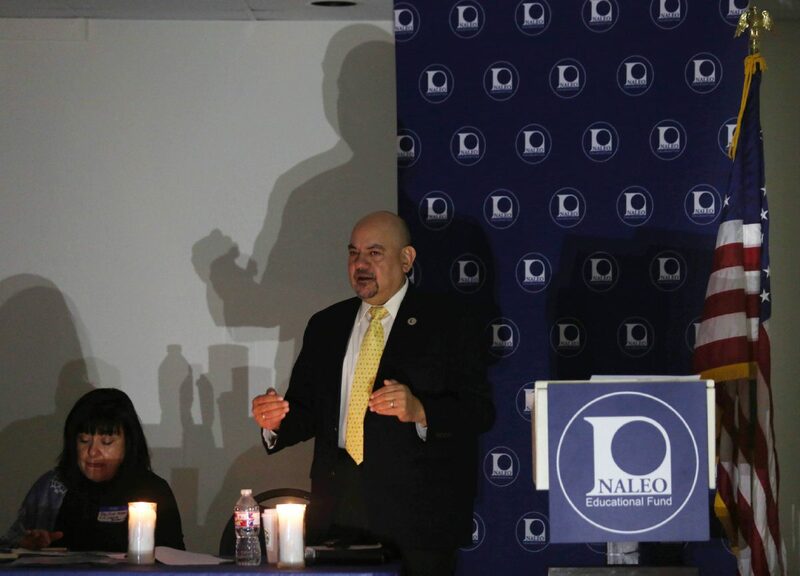 Arturo Vargas of the National Association of Latino Elected and Appointed Officials talks about the importance of the 2020 census as a power outage turned out the lights in the meeting hall at the Resurrection Catholic Church Tuesday, February 20, 2018 in Alamo. Amid the news that the Supreme Court will hear arguments that could impact the legality of whether or not a citizenship question can be included in the Decennial Census, U.S. Rep. Vicente Gonzalez, D-McAllen, is encouraging Hidalgo and Cameron county residents to apply for positions with the census bureau. 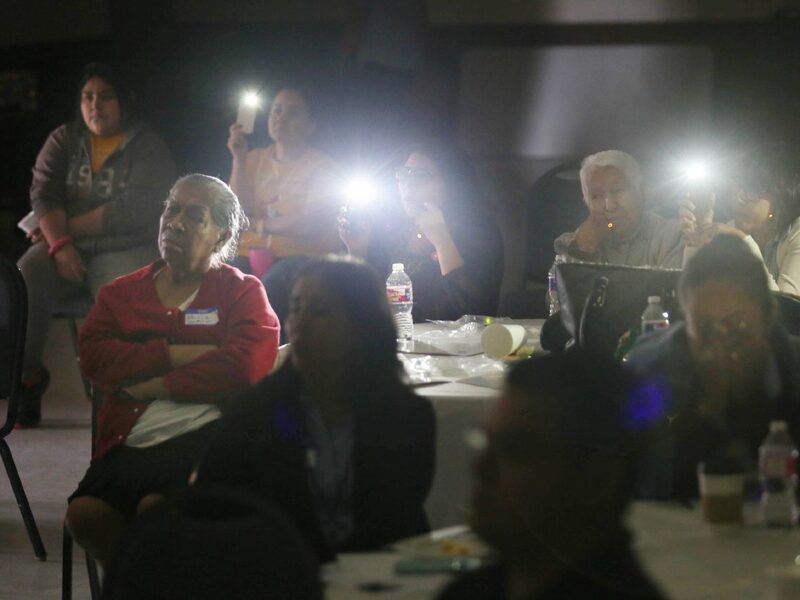 Veronica Casados, center, holds up a light on her cell phone that illuminates Maria Gomez, left, as they listen to a presentation on the 2020 census after a power outage turned out the lights in the meeting hall at the Resurrection Catholic Church Tuesday, February 20, 2018 in Alamo. Preparation for the census has begun and people at the meeting voiced concern on how the census will be administered and if citizenship questions will be on it. Last week, the Supreme Court agreed to hold a hearing Feb. 19 for oral arguments related to a lawsuit filed in April by nearly 20 state attorneys general challenging the bureau’s attempt to add a citizenship question to the 2020 census. The hearing is related to whether U.S. Commerce Secretary Wilbur Ross can be deposed in connection with the plaintiff’s case against the bureau and the Commerce Department. In early December 2017, the Department of Justice requested the bureau include a citizenship question in the questionnaire, according to a letter dated Dec. 12, 2017. “This data is critical to the department’s enforcement of Section 2 of the Voting Rights Act and its important protections against racial discrimination in voting,” the letter states. Ross has argued that the inclusion of the question is imperative to making sure the Voting Rights Act is being enforced. The U.S. Census Bureau has conducted the census every decade since 1790. The last time the census asked a question related to citizenship was in 1950, according to the government agency’s website. In the 1960 census form, it asks the respondent only about birthplace, and not citizenship, according to the bureau’s website. Those who oppose the citizenship question argue that it would discourage non-citizens and people who belong to large immigrant communities in several states from participating in the census — threatening the accuracy of the count. The inaccurate count could also result in the loss of not only millions in federal funds for the aforementioned communities, but also funding for federal highways, early childhood education and children’s health insurance, to name a few, but also without an accurate count, state representation could be disproportionate because the census count determines the allocation of seats in the U.S. House of Representatives — non-citizens are included in that count. Locally, efforts are underway to educate residents of the importance of participating in the count. Earlier this year, officials with the National Association of Latino Elected and Appointed Officials Educational Fund, or NALEO, and members with the Rio Grande Valley Equal Voice Network, a local network of advocacy groups, met with officials with the U.S. Census Bureau on how to best achieve a complete count for the 2020 Census. During a meeting in February, RGVN members and others made it clear to bureau officials how detrimental adding a citizenship question would be to achieving that goal. Vargas said it would be unconstitutional for the bureau to add the citizenship question. Also during that meeting, Juanita Valdez-Cox, executive director of La Union del Pueblo Entero, the local immigrant advocacy group also known as LUPE, said convincing a vulnerable population to answer citizenship-related questions would severely hamper efforts to get a complete count. Those interested in applying for a census position may visit the official U.S. Census Bureau website, .